Waukesha® Metal Products employs leading edge and industry-standard metal stamping presses for both large and small runs. Paired with the more than 40 years of experience in the industry, this full selection of capability and capacity allows us to provide single-source solutions for many of our customers. Our wide range of equipment enables us to work up to 660 tons and speeds up to 250 strokes per minute. Armed with an in-house tool and die design team using SOLIDWORKS and Logopress tool and die design software, we’re equipped to handle the most demanding metal stamping projects. Waukesha Metal can produce stampings in a large variety of materials, including high strength, low alloy (HSLA) steel, low carbon steel, stainless steel, copper, aluminum, and brass. We design and build precision progressive dies as well as transfer and stage tooling, with a focus on production efficiency and decreased tool wear. You can find a full list of our metal stamping equipment below. Our investment in a Komatsu servo press is a direct result of our constant drive for innovation, with the goal of constantly providing the best value for our customers. The electric servo press allows us to execute more innovative options for shaping material by utilizing programmable ram velocity or motion rather than the traditional fixed stroke or motion of mechanical geared machines. Paired with proprietary tooling, servo presses can also reduce secondary operations and tooling costs, creating shorter lead times for more complicated projects. 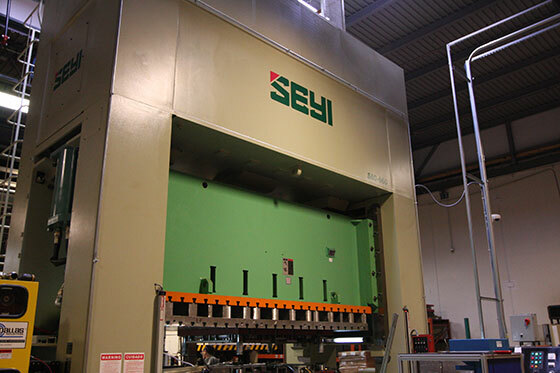 To learn more about our servo press technology, click here. The equipment is the tool with which our dedicated and experienced in-house tool and die craftsmen and innovative design and engineering team come together to execute on our customers’ project requirements. If you’d like to see some of our equipment in use, watch some of our videos.